Does the design of your store or restaurant reflect your brand’s personality? Or is it out of sync with the message that you want to convey? Retail design is a physical representation of a brand that shapes customer experiences. Lighting, color, materials, fixtures, layout, graphics, and digital signage all influence perceptions and express brand identity. This concept will be discussed in more detail below with reference to case studies featuring environmental design work by Shikatani Lacroix. Lighting can shift the mood of a space dramatically, bringing it from an engaging, high energy atmosphere to a cozy, calm environment. Light fixtures can add personality as well, such as elegant chandeliers or modern styles that give a space pops of color. 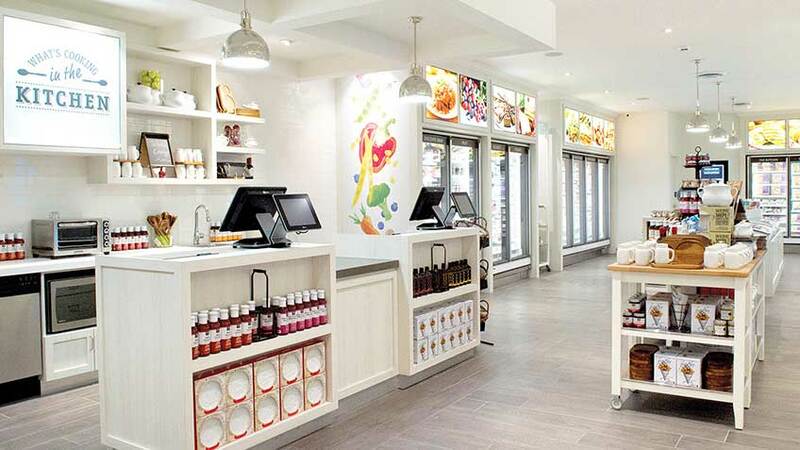 Case Studies: In the recent redesign of M&M Food Market stores, kitchen-like overhead lights give the space a warmer and friendlier tone to encourage more pleasant shopping experiences where customers can speak to helpful meal advisors and feel more at home. Lighting in the design of Cineplex VIP Cinemas is also influential, creating a more premium environment in the lounge and bar sections and making going to the movies feel like a special occasion. Color and materials can play large roles in expressing brand identity. Neutral colors, such as grey, white, brown, or black often create more classic, calm atmospheres while orange or bright green convey a more vibrant tone. Materials influence a space in a similar fashion. For example, adding in wood or brick materials can create a warmer feel while metals and glass often contribute to a contemporary personality. Other materials, such as marble counter tops and leather seating may make a store seem more premium while plastic seating appears more laid-back. Combining these elements in different ways can create an atmosphere that matches your brand identity. If your store or restaurant feels too overwhelming or intimidating, for instance, touches of a neutral color or natural materials will moderate those feelings. 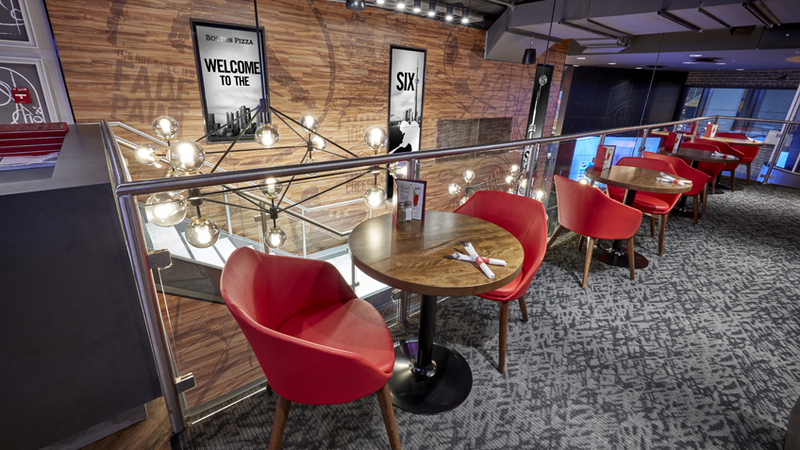 Case Study: In the new Boston Pizza design, colors and materials reflect the excitement of being a sports fan. Red accents and glazed finishes create a modern, bold, and engaging atmosphere; while brick veneer and vinyl wood plank walls, concrete-inspired porcelain tiles and dark grey metals give the space an industrial, down-to-earth, and welcoming feel. Retail fixtures display products while dividing up a space. Their style may be traditional or modern and can influence perceptions. For example, an environment might seem more innovative, eclectic, or organized based on its fixtures and merchandising displays. Layout also influences how open or cozy a space feels and directs how you want customers to move through it. 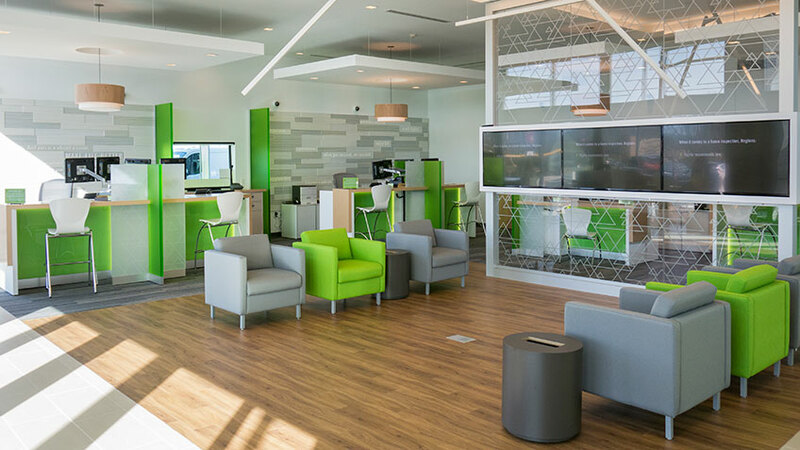 Case Study: Comfort and ease are prioritized in the fixtures and layout of Regions Bank. A cozy waiting area with a coffee bar is available, and seated semi-private universal banker stations replace the teller line and counter. An open interior with clear sight-lines and signage allow customers to navigate the branch more intuitively. Graphics on signage, walls, or digital screens can help create a distinctive brand identity and add personality to a space. They provide an opportunity to use color, shape, imagery, and words to reinforce or support a brand message and create a more interesting shopping experience. Case Studies: One example of using graphics to express brand identity is in the design of Calgary Co-Op. This supermarket uses graphics on its navigational signs to clearly distinguish between departments and create a contemporary, vibrant, and fun look. 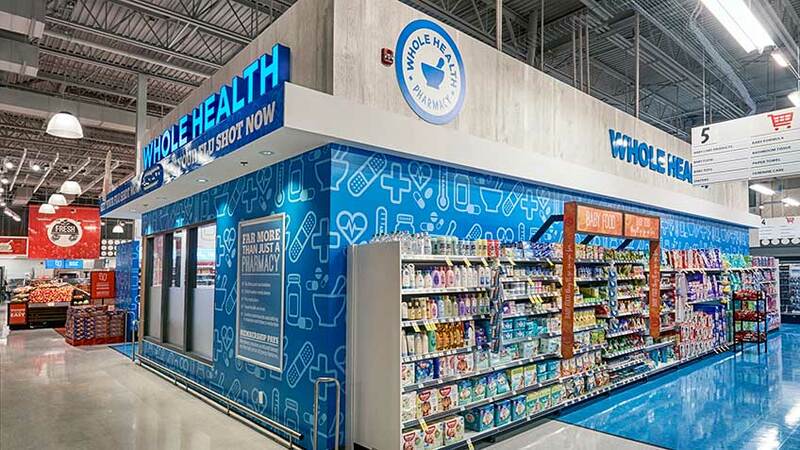 In the Frozen section, symbols of snowflakes and thermometers communicate its product offering, while the Health section uses band-aid and heart symbols. Similarly, the graphics in the telecommunications store Flow reinforce its vibrant and friendly personality as well as its Caribbean location. Bright, dynamic, and colorful wave graphics are visible throughout the store. In these ways, lighting, color, materials, fixtures, layout, graphics, and digital signage in your restaurant or store combine to bring your brand to life. Having a consistent personality in all channels is vital to ensuring a strong market impact, and your physical brand presence is a key channel where customer impressions are formed. For more case studies on how design elements can help express brand identities, click here.